Floral hijabs are quite well known, they suit a variety of fashion styles and most girls tend to wear it just to feel feminine. Years back, flowers held important & symbolic meanings which people thought was quite important to put into their clothing. Flowers are known to be a strong symbol of femininity and it has flown through different eras, and cultures, making it the most well-loved type of print. 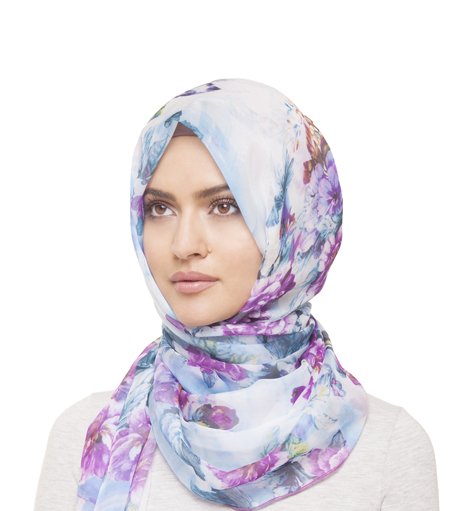 Inherently beautiful, floral hijabs are available in different colours textures, and styles. Think of dainty daisies, meadow poppies, lush roses or bold hydrangeas, flowers are the “in” thing and work wonders in how you look. Silk scarves with floral designs look gorgeous and make you feel beautiful and one in a million! In Japan, the chrysanthemum featured heavily in textiles – It’s naturally long, slender petals radiated similarly to the sun’s rays, and so the flower became synonymous with the sun and was also a symbol of the royal family. In China, flowers were woven into stunning, brocades or created in detailed embroideries and peonies were often used to represent the juxtaposition of wealth and honour. Lotus flower was another common motif. An important symbol in Buddhism, this particular flower represented purity, as it rises from the mud to bloom. so you want that flowery feel? Floral designs are currently everywhere at the moment, raging through Asian and western wear, it is the ultimate badge of spring and summer femininity. Turkish floral hijabs look really good as well. Try pairing your Hijab with a long flowing dress for that luscious summer feel and stand out from the rest!